A-HOTEL.com - Luxury and cheap accommodation in Korotchaevo, Russia. 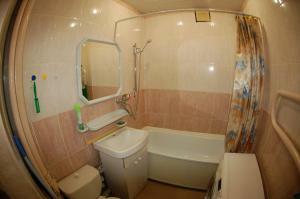 Prices and hotel, apartment booking in Korotchaevo and surrounding. This indicative offer was derived from the most recently booked accommodation in Korotchaevo and sort by the price, from cheapest Korotchaevo accommodation to the most expensive hotels. To select accommodation by your preferences we recommend to choose from 2 accommodation offers in Korotchaevo in total. By entering the dates of your overnight stay in Korotchaevo and using the filter tools you can sort the best possible accommodation for you. The entered dates of your stay are crucial for the most accurate offer as it derives all the online information on pricing and availability of Korotchaevo accommodation. Then you can book the selected Korotchaevo lodging (hotels, apartments etc.) immediately. Located in Korotchaevo in the Yamalo-Nenets Okrug region, Apartment on Prospekt Mira features a balcony. Guests have access to free WiFi. Set in Korotchaevo in the Yamalo-Nenets Okrug region, Apartment on Prospekt Mira 38 has a balcony. Guests have access to free WiFi. Apartment Spektr is set in Urengoy. This property offers access to free WiFi. Featuring free WiFi throughout the property, Medveditsa offers accommodation in Urengoy. Free private parking is available on site. Set in Novyy Urengoy in the Yamalo-Nenets Okrug region, Апартаменты Пять Звезд возле Центральной площади features a balcony and city views. Guests have access to free WiFi. Set in Novyy Urengoy in the Yamalo-Nenets Okrug region, Апартаменты Пять Звёзд в центре города на Ленинградском проспекте features a balcony. Guests may enjoy free WiFi. This hotel is located in the centre of Novy Urengoy, within a 6-minute walk of the Train Station, Art Museum and the Gazprom Museum. AMAKS Polar Star offers free Wi-Fi in public areas. Located in Novyy Urengoy in the Yamalo-Nenets Okrug region, Apartments 5 zvezd Leningradski prospect 10 has a balcony. Featuring city views, this apartment also includes free WiFi. Offering free WiFi and city views, Apartments 5 zvezd Excellent is an accommodation situated in Novyy Urengoy. Guests staying at this apartment have access to a fully equipped kitchen. Апартаменты Пять Звёзд Комфорт is situated in Novyy Urengoy. Featuring city views, this apartment also has free WiFi. Апартаменты возле Центральной площади is situated in Novyy Urengoy. This property offers access to free WiFi. Offering free WiFi and city views, Apartment 5 Zvezd Prestizh is an accommodation situated in Novyy Urengoy. Guests staying at this apartment have access to a fully equipped kitchen. 7-2 is situated in Novyy Urengoy. The nearest airport is Novy Urengoy Airport, 5 km from the property. 487 is located in Novyy Urengoy. Novy Urengoy Airport is 5 km from the property. Featuring accommodation with a balcony, Апартаменты Home Hotel на Восточном is set in Novyy Urengoy. Guests have access to free WiFi. Апартаменты Элит is located in Novyy Urengoy. Guests staying at this apartment have access to free WiFi. Featuring free Wi-Fi access throughout, Yamal Hotel offers rooms in the centre of Novyy Urengoy, a 2-minute drive from Novyy Urengoy Train Station. The property has free parking available on site. Восточный 5/7 is set in Novyy Urengoy. This apartment offers accommodation with a balcony and free WiFi. Situated in Novyy Urengoy, Apartment Zheleznodorozhnaya 6b features free WiFi and units fitted with a kitchen. Each unit is fully fitted with a washing machine, a TV, a sofa bed and wardrobe. Apartments 5 zvezd Skver Stroiteley is situated in Novyy Urengoy. This apartment provides accommodation with free WiFi.